WATCH as Australian Nick Malouf executes a massive tackle on South African Stedman-Ghee Gans in the fifth-place play-off match in Sydney on Sunday. The rib-rattler left Gans in pain on the deck! 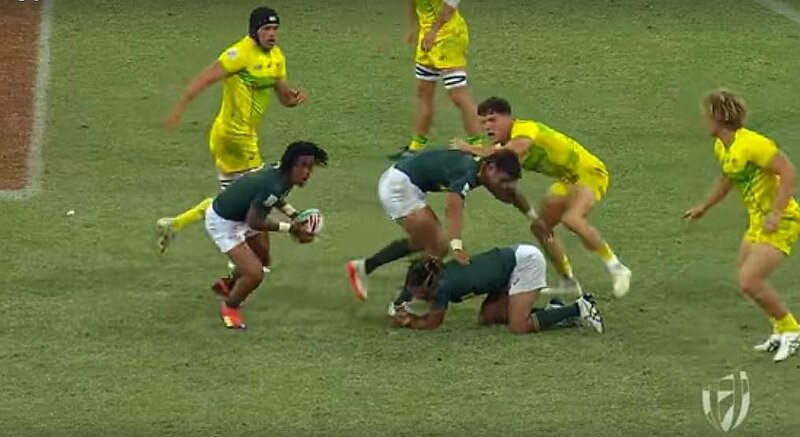 The Springbok Sevens finished fifth in the HSBC Sydney7s on Sunday in a weekend contrasted by good wins and unfortunate defeats but still managed to retain their fourth position on the overall HSBC World Rugby Sevens Series standings. The Blitzboks ended the tournament well with a 12-10 win over Australia in the fifth place play-off after earlier in the day beating Spain 33-0. They had started Sunday on a disappointing note however, losing to England 26-5 in the Cup quarterfinals. Powell refused to blame the lack of experience amongst the ranks for some of the errors made, but admits that lessons learned must be implemented. Powell said some honesty and frank discussions will follow when the team has its de-brief. The team remained on the top four in the standings, but are now 19 points behind the log leaders, New Zealand and USA. “The main focus still remains Olympic qualification with a top four finish, so we have to improve all the time,” Powell said. Powell, the current World Rugby Sevens coach of the Year, did take some positives from the win over Australia. “We had to tough that one out and that was good. We defended much better and it felt a bit like the old days where teams really had to work hard to get a try against us. The team were outplayed by England 26-5 in the Cup quarterfinals in a match where they could not get going. The England side scored two converted tries in quick succession to lead 14-0 at the break. The Blitzboks started the second half on a positive note, with Zain Davids thundering down the touchline to score in the corner, but two late tries by England sealed the deal. Kyle Brown, who replaced the injured Philip Snyman in the match day squad, also took to the field to become the most capped Blitzbok of all time, passing the 68 tournament mark he shared with Frankie Horne. The South Africans showed much more clinical execution in their fifth place semifinal against Spain, who earlier lost to USA in their Cup quarters. Selvyn Davids scored in the first minute to show the Blitzbok intent and added another six minutes Sorry. He converted both for a 14-0 lead at the break. A brace by Siviwe Soyizwapi and a last gasp try by Dewald Human confirmed the South African dominance in the match. Against Australia, Selvyn Davids scored early to give the Blitzboks a 7-0 lead. Australia scored either side of the break to take the lead, but Brown had the final say in the match, dotting down in the corner in the final play of the match.